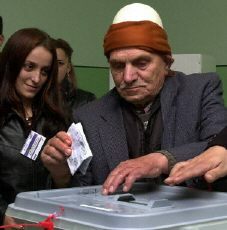 Are most Albanians racially Europid? Thread: Are most Albanians racially Europid? The recent talk about 'white' Turks and Indians reminds me of a question I've had for awhile. I ask because it seems like many people in our 'movement' condemn them as 'non-white' for what seems to me to be cultural reasons (ie: they are Muslim). Even on SF the mods allow board members to make posts in which Albanians are called 'non-white'. Is there actually any truth to this at all, or are people simply confusing race and culture when it comes to Albania? Albanians have been invaded by non-white turks and most are muslim.Muslims autmatically carry the name of non-white while some might be just converted.Turks are non white.Facts is that Albanians tend to have a slightly darker skin then average.I consider them part mediterannean,and I do think most of them have Turkish blood.I don't think muslims make sense on the SF board. That's odd, I didn't realize religion was so powerful to alter people's DNA and racial phenotype. I suppose if I converted to Judaism I'd grow a big nose. eyes: I don't see why it matters which Semitic non-European religion they believe in, but there are many Albanian Christians (Orthodox Christians and Roman Catholics) who look no different from the Muslims. There are plenty of Albanians where I am from, and they are not well liked here. Most of them look to be blends of Dinaric, Orientalid and unknown Nordish strains and small a minority of totally Nordish people. They are mostly brunet and very similar to Romanians. I've only known one blond Albanian, who was Noric. Racially they fit more with Near Easterners than Europeans, this is also true of the majority of Greeks and Romanians, IMO. Try saying anything negative about Greeks or Romanians on SF, though. Albanian is an Aryan language, however. Albanian, known to native speakers as Shqip or Shqip'ri, is spoken by about 6,400,000 people along the eastern Adriatic coast, primarily in Albania, but also in neighboring Kosova and Macedonia. Although Albanian belongs to the Indo-European family, it constitutes a major branch of its own, with no near relatives. The Albanians are divided into two major groups, the Gheg and the Tosk, according to which Albanian dialect they speak. The Gheg live north of the Shkumbin River, while the Tosk live south of the river. John and Jim Bulushi were/are of Albanian decent. They both look European to me, albeit John could have passed for a Near Easterner I think. Often times religion and race do go hand in hand when it comes to repopulating, intermixing, and replacing previous races. We must remember the Keltic people once occupied area as far east as Turkey and we must assume, despite different tribes and regional variations, that there was some degree of homogeony among them. After the Byzantine Empire was sacked in 1453, the entire region was inondated with Islam and the darker practitioners of it. After residual pockets of Islam dried up in merely symbolic religious vapor, the tangible racial strains still remain. This is why we see dinarics as far as Germany and even England. Certain areas of Albania are probably the most dinaric in Europe. Greece and Romania are two European christian countries.. why be negative towards them.. in the face of the onslaught from the third world we all need to stick together to avoid the racial mess you guys alrady are in.... and our major cities aswell.. however I dont see how you can be so critical against for example Romanians and then next second embrace Mongolic Hunn admixture in Hungary???????? just a question...??? See, this is part of what puzzled me. It seems like Greeks are accepted by most 'white nationalists'. You can't question their racial makeup on a board like SF. Yet Albanians, who are right next door, are called 'non-white'. It seems illogical that most Greeks are 'pure white', yet most Albanians are not. The fact that most Albanians are Muslim seems to be the sole reason they are excluded from the 'movement'. The reason obviously is not racial, because as you pointed out, most Greeks and Romanians have near eastern racial influence. It is extremely visible in many of them, especially the Greeks. Certain areas of Albania are probably the most dinaric in Europe. I agree with you 100%. But don't they seem 'extra' dinaric to you? Like....all their dinaric features are exagerated when compared with dinarics from other European countries. Maybe there is an armenid admixture to account for this? I think its easy. Albanians are as white as Greeks... but isent it rather what kind of society we want to live in, our heritage is a western European one starting with the Greeks and Romans wich has lead us to this present day, we want a free society with respect for rights, women, free thinking, development e.t.c. that is not in accordance with muslim way of life, near eastern. do you mean like Middle east by that? Ok, so lets look at it from the perspective that both Greeks and Albanians are 'white'. You say the reason for the anti-Albanian sentiments is their religion...and I agree. But then why is it that on boards like SF Albanians are attacked not only due to their religion, but due to their racial makeup? Why is it that questioning the racial makeup of Albanians is tolerated, but questioning the racial makeup of Greeks is not? Lets say that tommorrow Sweden became a communist country. Now we hate communism, but would the white nationalist movement attack the racial character of Sweden because of its political/economic views? I would hope not. That's stupid. Why then is this done to Albanians? Are white nationalists unable to seperate race and culture? 1) I see an inability amongst so many in this movement to seperate race from culture (as well as from geography, but that does not really enter into this discussion). 2) I see a total double-standard: If "white nationalists" question the racial makeup of Albania, it is fine. But if they question the racial makeup of Greece is it "divisive". I mean, I thought this 'movement' was about truth. WTF? i agree.. Albanians are white.. its stupid to say that they are not just because their religion..many times i think its just a way of saying " you dont fit in with our community " anyway.. i dont get the this questioning of the Greeks, the founders of modern Europe.. its kind of rediciluos.. bearing in mind how the US and many EU big cities looklike.. but i agree, religion doesent change race.. however. our culture IS important.. muslim culture can NEVER be EUROPEAN. The Albanians shown by LadyGoeth33 are non-Europid I suppose except the soldier perhaps and some of the refugees. They remind me of most Turks. Regarding Race and Culture, I believe that the two are separable and Race is more important and determinant, yet Cultural distinctions are not to be avoided, Race is nothing without Culture but mere Biology and Anthropology.